You can scroll and capture whole webpages into PDF text documents, highly useful for sharing information. The integration process is a bit overly complicated and Internet Explorer should not be the program's browser of choice. A well-rounded program with an accessible interface, lots of useful features but a higher than average price as well. 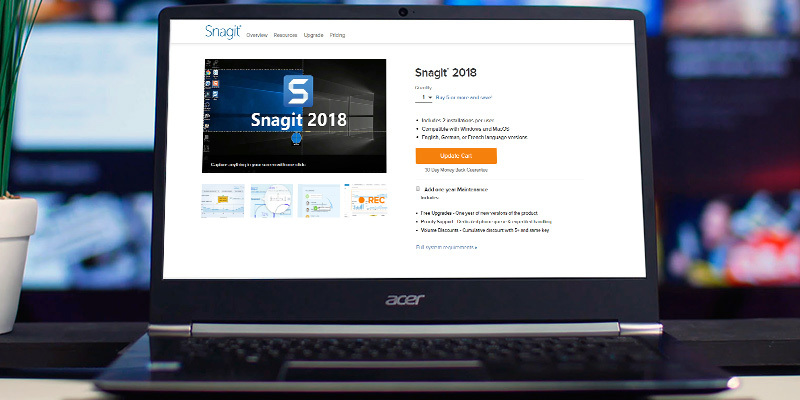 Despite a few minor flaws, the TechSmith Snagit seems to be one of the most advanced programs of this kind in terms of sheer utility and output quality. It's an overkill for basic screenshotting but great for work-related tasks that may require image capturing and editing. You can add annotations and drawings both to images and videos with editing capabilities broader than you'd find in most competing software. The tutorial pop-ups become annoying quite fast. 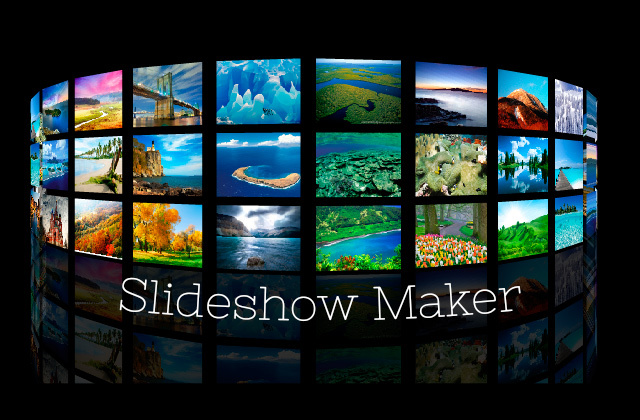 The abundant tutorials make this program one of the top choices for newcomers and those who want to learn a bit more about image and video editing. However, pros might not find as much to be impressed by aside from the high performance levels and integration with the social media sites. 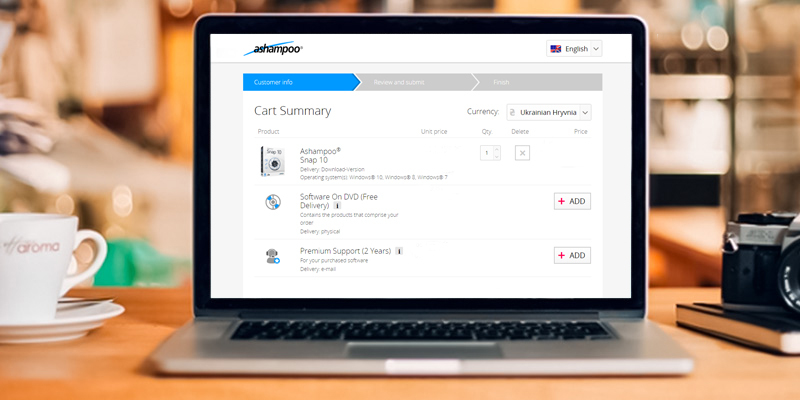 If you want a bit of a bargain, the Ashampoo screen grabber is a fine choice that may just be a bit more suited for amateur users. You can put your own watermark on the recorded videos if you'd like to protect your intellectual property. The program is one of the priciest out there. 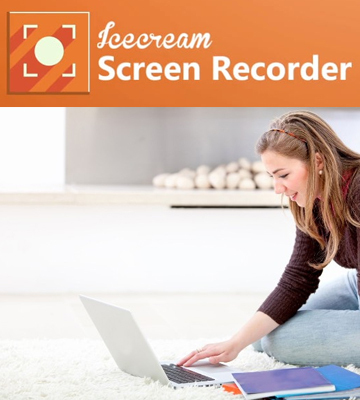 Combining all of the standard functions as well as a few add-ons such as voice overlaying, capturing from multiple screens, and watermarking, the Icecream Screen Recorder PRO is a great choice if you want to create professional looking videos. It's a bit on the expensive side but it's worth the cost if you want real quality with no errors or crashes. You can record footage from the screen of your phone by simply hooking it up to your PC via a cable. The video editing capabilities are quite sparse. Although it may be lacking in terms of video editing, this program is a pretty comprehensive tool for screenshot creation and manipulation. It's a bit pricier than average but the simple accessible interface, low processing power requirements, and a couple of unique features make this one of the top-tier choices among screen grabbers. This program is capable of creating gifs from the footage you capture. Besides, it's great for streaming as you can embed your webcam input anywhere in the footage. The videos have dips in the framerate. 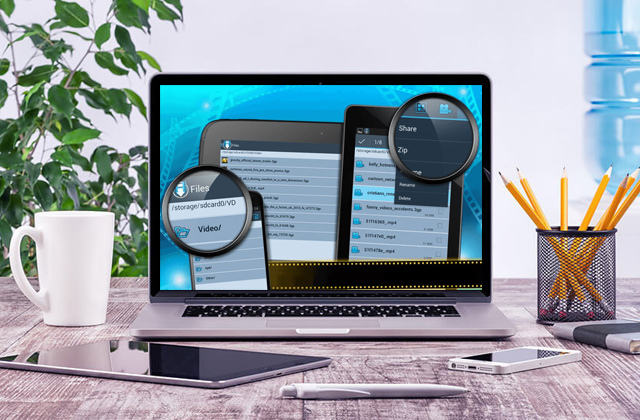 This browser extension is great for those that want to preserve their screenshots safely in the cloud or have the chance to convert the output files seamlessly before saving them. 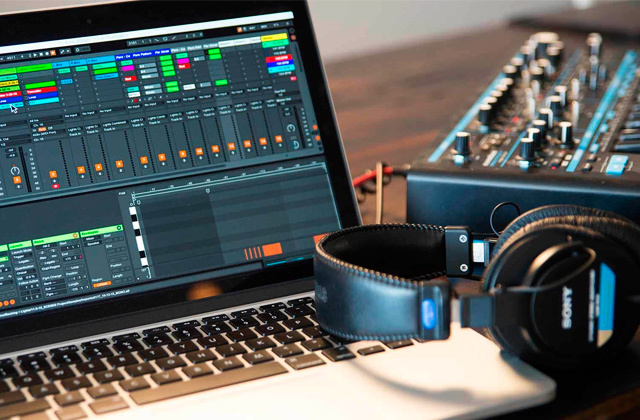 It has limited editing capabilities but makes up for them with a broad range of recording options and an interface that's easy to navigate. A viable high-tech alternative to the sluggish and processor-loading screen grabbers. We feel that any piece of good software, regardless of its purpose, should be well-rounded in features, interface, and accessibility. So any good program should look appealing, be easy to navigate, and, most importantly, be able to do things that its competitors simply can’t. Luckily, all three of these apply to the TechSmith Snagit Screen Capture. 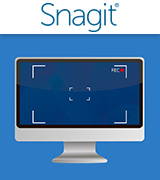 Despite serving ostensibly the same purpose as all other browser recorder programs, the Snagit software offers a wider range of editing and capturing tools as well as a more comfortable user experience. It all starts with the installation process that’s not only quick but also completely automatic, no need to double-check to make sure all components are installed and that nothing unnecessary ends up on your computer. Afterwards, the program offers a basic tutorial that will be useful for those that have no experience with this kind of software. However, if you already know a bit about such programs, feel free to skip it as the interface is quite intuitive. Speaking of the interface, the capture process will be easy to set up. 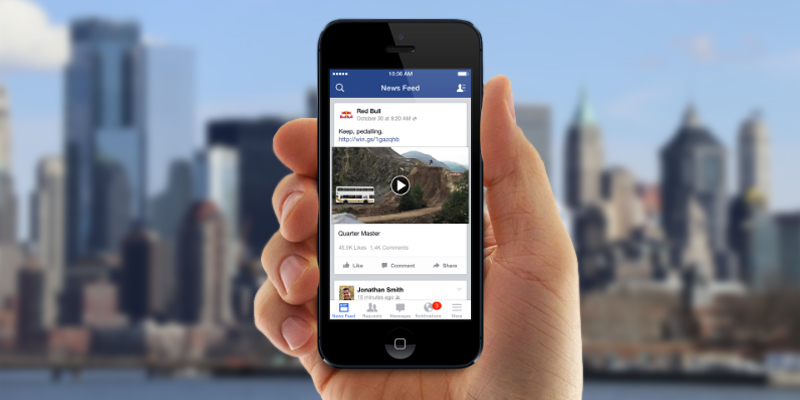 The main screen of the program immediately gives you a choice of capture format, depending on what you need to grab. 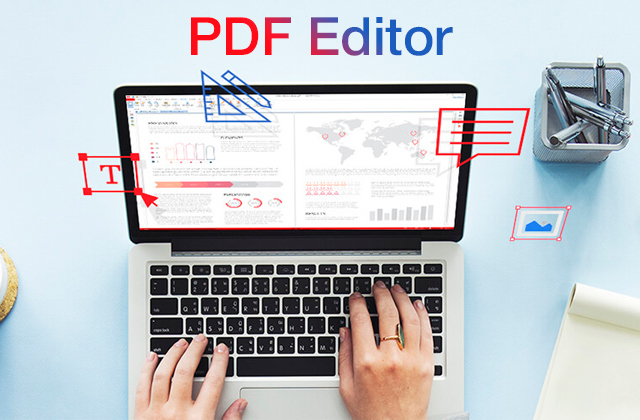 For example, you could take a snapshot of a whole web page (even a longer one, since you can scroll down and the contents will be added to the file) and turn it into a PDF document that you can save for later or send to someone that can’t access the page itself. Obviously, it also allows you to save an image of your whole screen or a single area or even a separate program window, highly useful for troubleshooting. Utility is a key parameter as well and that’s why we want our screen recording software to integrate with other programs or at least offer some convenience options. 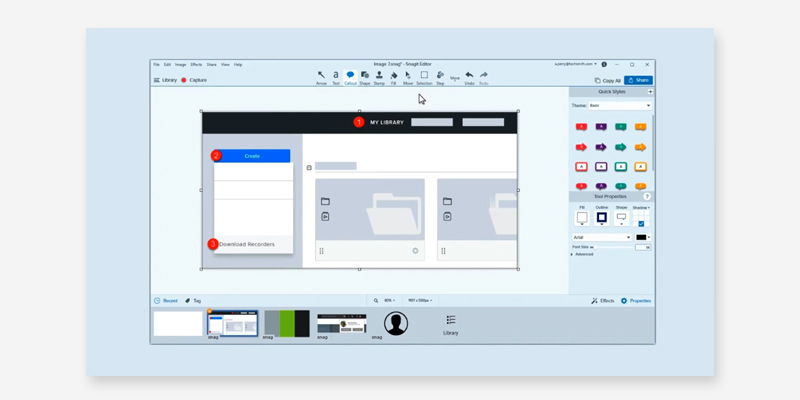 The Snagit offers a toolbar that you can use for quicker snapshots or saving webpages, compatible with all Microsoft Office programs. However, it only works in Internet Explorer out of all browsers, which is quite outdated and might not even load some websites properly. Definitely some room for improvement on that front. 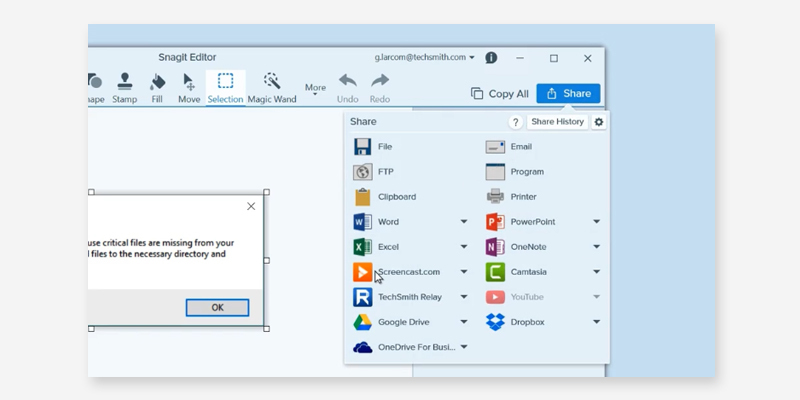 You can also synchronize the program to automatically attach the screenshots taken to an outgoing email but it’s a tricky process, pretty much the only part of the software that’s non-intuitive. However, once you manage to get the hang of it, it’s quite useful for those that need to share a particular image or text with someone. Those that want to record a video of their screen, either to show an error occurring or, perhaps, film some gameplay, can do so in high-definition. The resulting video will be in the .mp4 format, playable on most devices. And you won’t see any dip in performance while filming as Snagit is remarkably light on the PC. You can also edit the video after you’re done though, of course, the tools available aren’t as broad as those in actual video editing software. Even upon a closer look, it’s been tough finding any serious faults in the TechSmith Snagit Screen Capture Program. Sure, it could use some better integration options and the email synchronization is complicated but there are no issues that could become a dealbreaker. It’s tough to deny that the program has plenty of functions, works quickly, and doesn’t put any strain on your computer, which is pretty much all we could ask for from this kind of software. It is a bit pricey, of course, but if you plan on doing some complicated capture tasks, it may just be worth the price. 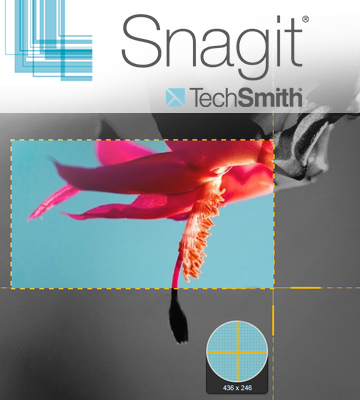 The TechSmith Snagit is a smart choice for those willing to spare the cost. Don’t feel like paying all that much but would like the kind of software that’s still up to par with the expensive programs? 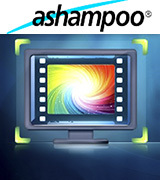 If you said yes and want to get your screen grabber on a bargain, we recommend the Ashampoo Snap 10 Screen and Video Captures. 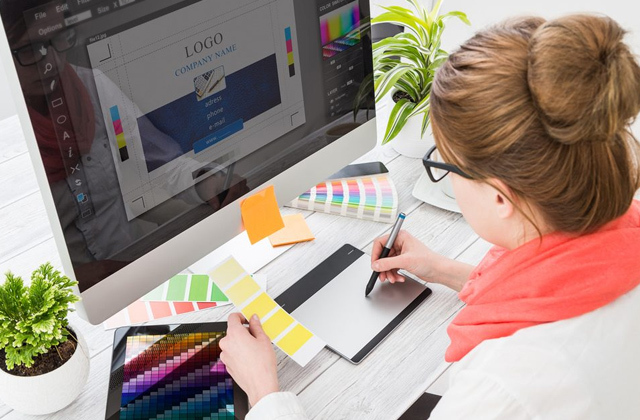 While the differences will still be there compared to the high-end software, this program is the closest you can get without breaking the bank. This particular piece of software would be suited best for work or educational purposes, such as sharing documents and screenshots. 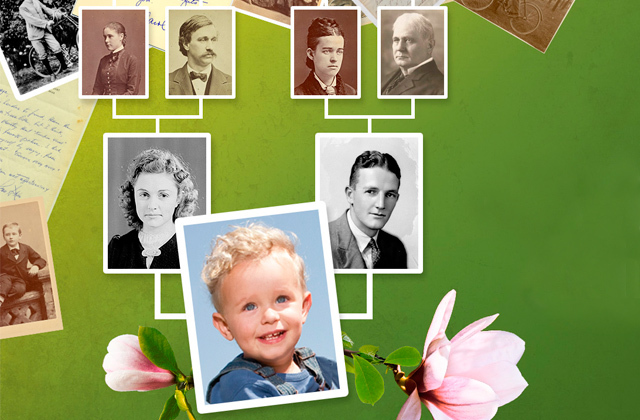 After you take a snapshot of your screen (or part of it), you can immediately edit the resulting image to add annotations or marks that will draw attention to a particular spot. That’s going to be highly useful for troubleshooting as well as leaving notes on a student’s paper. Obviously, you can do more than just take still photos of your monitor. 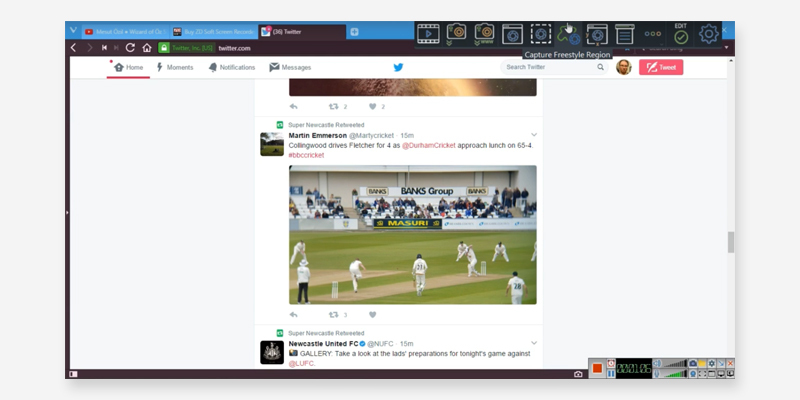 For example, the Ashampoo Snap 10 lets you take a spliced picture of several screens at once as long as they’re merged into one system. That’s particularly handy for coders as you can both showcase what you wrote and how it ended up working (or not working). Plus, you can take videos and time-lapses to show the progress of some particular process on your screen. With that kind of functionality, we definitely were looking forward to seeing what kind of support and tutorial capabilities the Ashampoo Snap 10 offers. And while the FAQ is pretty extensive and any issues can be resolved via an email, it would have been nice to get a phone support line since you don’t always have the time to wait for a response to your letter. 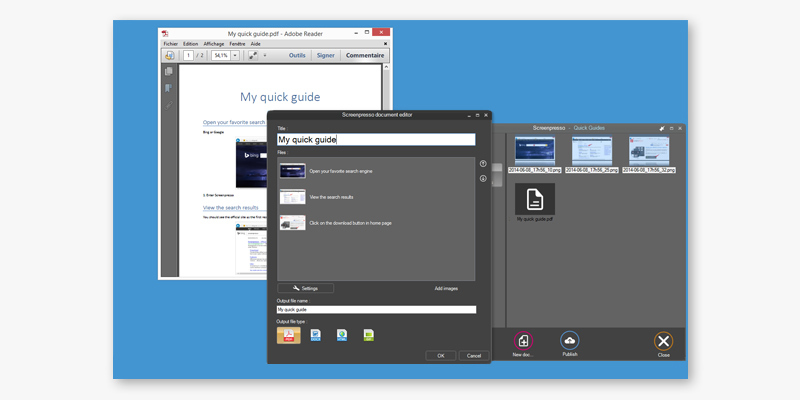 Plus, the tutorial, while useful, is a bit invasive, popping up any time you open a new window or use a new feature. It’s definitely a big help for newbies but those with some experience will likely just be annoyed. We wouldn’t have minded the abundance of tutorials as much if the program was difficult to use but the Ashampoo Snap 10 is quite simple and accessible. 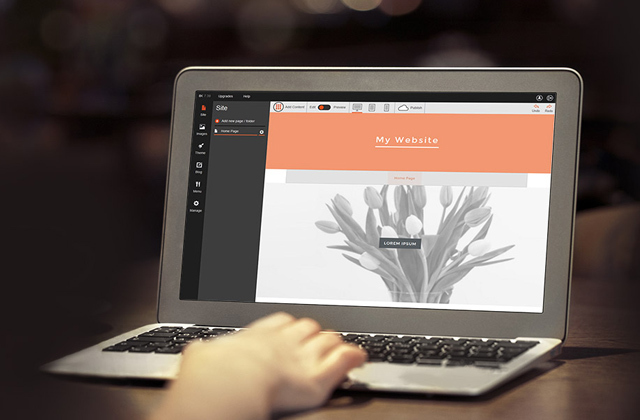 It has a toolbar for quick access to screenshot-taking options and customization of the images. The program even lets you sync it to social media like Facebook in case you need to share a picture of something with your friends, though we feel like that’s not a feature that’s going to be too popular. One last bit we want to mention is the output files themselves. Despite working with the high-quality .png format, the program always puts out lightweight images that aren’t going to take up much space on your hard drive. 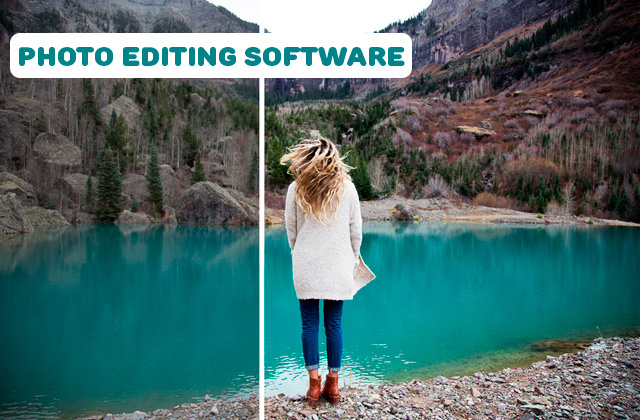 You won’t even have to tweak any settings as this screen capture software records video and images with no blurring or quality loss right away. 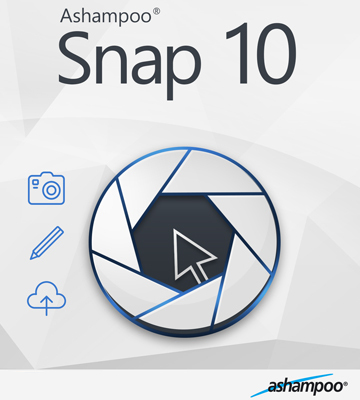 So if you’re looking for a reasonably priced alternative to the more expensive screen capture software that supports Windows 10 as well as the OS that came before, the Ashampoo Snap 10 is a viable choice. It’s got reasonably broad editing capabilities and saves screenshots in high quality without making them too weighty. 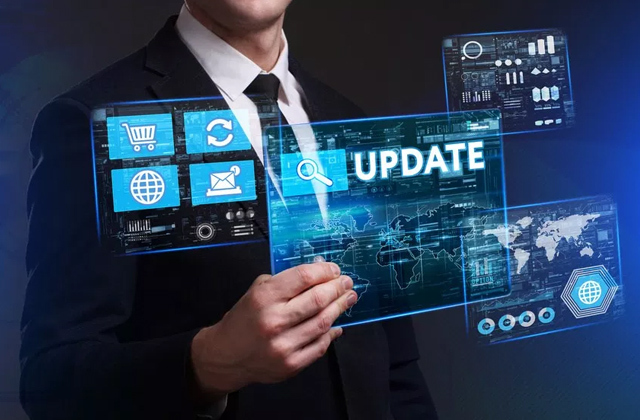 While it does feel like the program is overly invasive at times, offering tutorials at every step of the way, this is probably something that new users will appreciate, learning to use the program feature by feature. All in all, a thrifty choice for inexperienced users in particular. Need to make a tutorial on how to use a particular program on your PC, either for a clueless colleague or your older relatives that simply might not be able to master the tech on their own? 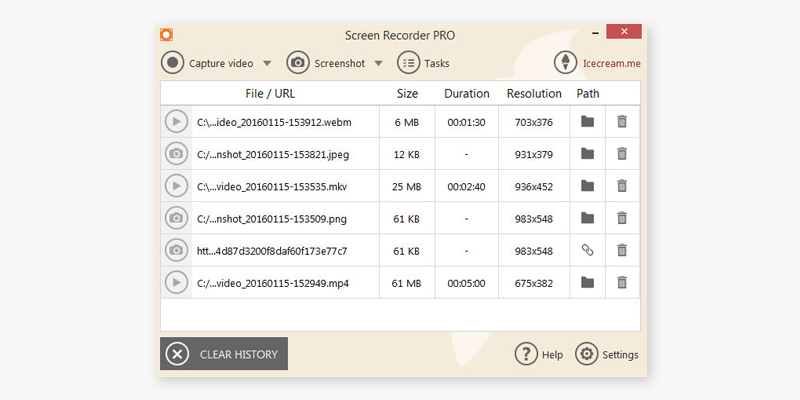 You won’t have to use any ultra-complicated software as the Icecream Screen Recorder PRO does the job well without requiring any know-how. The program lets you record a full video with voice and edit in several annotations or drawing that will make it easier to understand. There’s one undeniable advantage to using the Icecream Screen Recorder as most of its competitors only offer a timed free trial that’s usually no longer than 15 days. However, this program can be used as much as you want for free, just with a curtailed range of tools. It’s still completely viable even without paying a cent, which is a big plus if you’re apprehensive and would like to try before you buy. 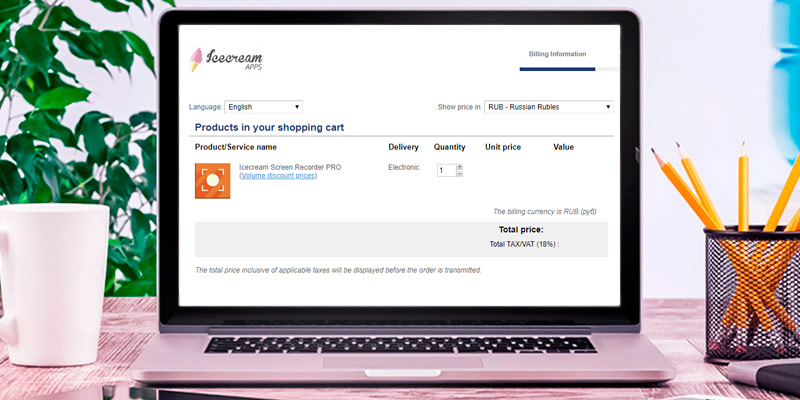 We do recommend switching over to the paid version later on, even though it’s a bit pricey compared to some of the other software of this kind. Purchasing the program opens up a pretty large array of new features that will help you raise the quality of your videos as well as diversify them a bit. 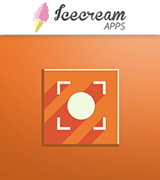 Besides, you can only record up to 10 minutes using the free version, while the paid one has no restrictions. Now, let’s assume you’ve paid up and got the PRO version of the program. What can you do? Any video you record can be edited to add drawings or annotations, particularly useful for tutorials. If you’re creating some sort of unique content and want to protect your intellectual property, don’t hesitate to slap a watermark on the video just in case. You can, of course, record both the whole screen and areas of it, including particular programs. That’s a perfect setup for gameplay filming so you can use this as a screen recorder for YouTube videos. Since the videos come out in a variety of formats, they’ll be easy to upload to the website, especially if you use the advanced settings of the software and lower the output file’s size. We also liked the fact that you can set up a timer to record your screen in intervals, though it’s yet another feature that’s only available in the paid version. 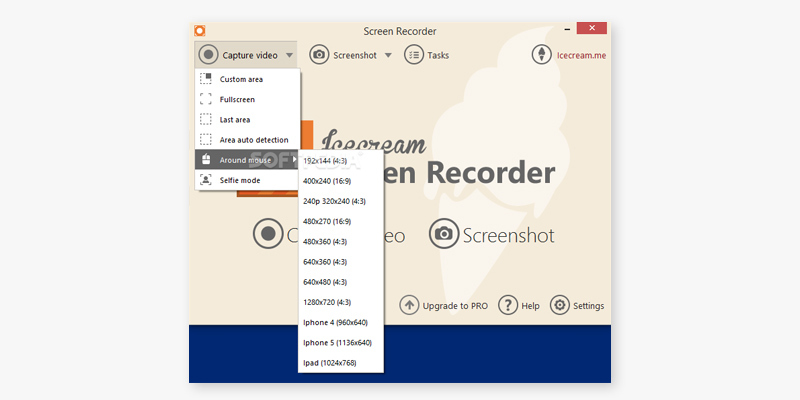 It’s important to mention that the Icecream Screen Recorder PRO is definitely not the most visually appealing program we’ve seen. The interface is quite basic and looks like something out of the Windows XP days for sure. It is, of course, a double-sided coin as this simplicity makes the program easier to master. So if you’re not averse to paying more to get more, the Icecream Screen Recorder PRO is a very solid choice. Not just because you can try it before you buy it but because the purchase comes with just that many features. Record videos from multiple screens at once, capture gameplay, edit the resulting videos, and even watermark them for copyright purposes. The output formats are varied and the program is easy to master even for a complete newbie, which makes it great for both an amateur and an experienced user as well. An absolutely fine pick if you want video capture software for streaming and YouTube as long as you can stretch your budget for this one. 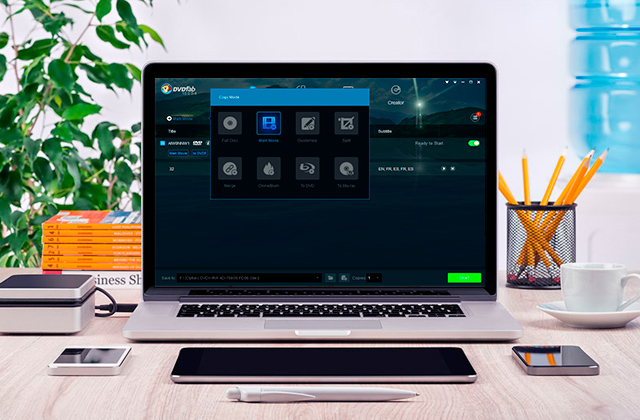 Not everybody needs outstanding tools just to take a few screenshots but the best screen capture software usually comes with all these extra features like video editing and such. 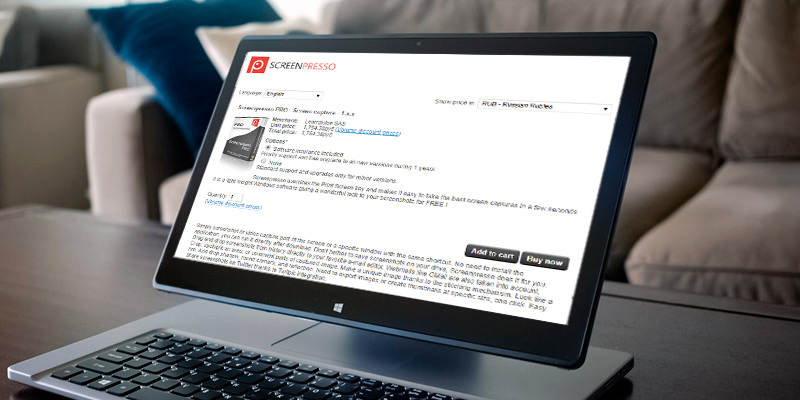 However, you don’t have to settle for a bulky program that will slow down your PC’s performance if you choose the Screenpresso PRO instead! 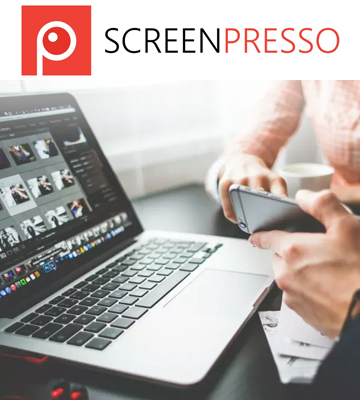 This program offers just as many screenshot taking and editing capabilities as many of its heftier counterparts but the Screenpresso PRO is remarkably efficient and doesn’t put any strain on your processor. 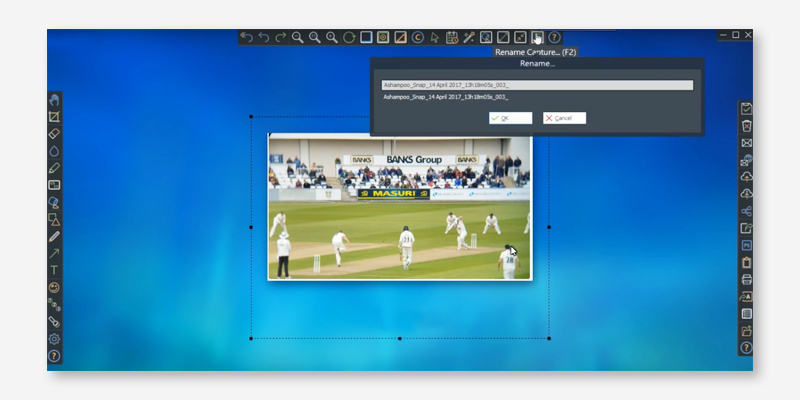 You can still get snapshots in .jpg and .png formats and edit them by adding drawings or cutting out parts that you don’t need. And, obviously, you can take a whole-monitor screenshot or only grab a particular area, depending on what you have to show. There’s also the highly popular option to take a snapshot of several screens at once, good for multi-monitor setups. All of these features and more are available even in the free trial version of the program, which you can use to see if it fits your needs. We do recommend doing that as the full version is a bit pricey, especially considering that the program is pretty basic for this kind of software. So yes, the free version is a big bonus. All that said, it’s tough to deny that the best screen recorder doesn’t stop its job after simply taking a screenshot or filming a video. The program should also help you edit the resulting file, adding annotations, splicing different short clips together, or adding a voiceover. Sadly, the Screenpresso PRO is most impressive when it comes to image manipulation but its video editing doesn’t quite live up to the standard set by the rest of the software. Pretty much the only thing you can do in the editor here is cut off parts of the footage. You can’t adjust the audio in any way, can’t add titles or annotations or anything of the sort. 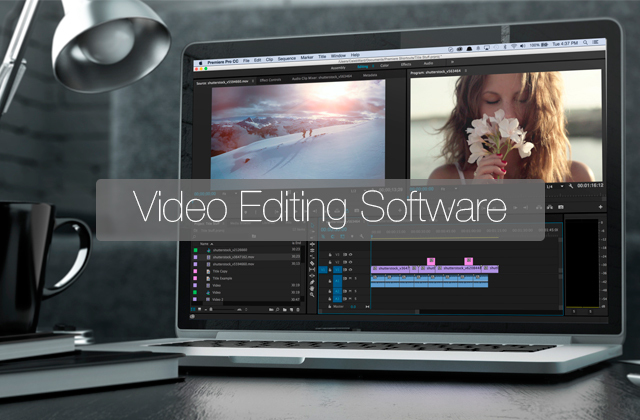 We’d recommend coupling this program with full-blown video editing software if you want to get the most out of your recordings. Let’s end on a good note though as the Screenpresso PRO does have a particular feature that we’ve not seen in any of its competitors. The program lets you record the screen of any Android/iOS smartphone that’s hooked up to your PC via a cable. It’s a niche application for sure but it’s nice to have the option, especially since it’s not something you could find elsewhere. You can also, of course, record anything your webcam sees and take clips of your Skype chat sessions with friends. 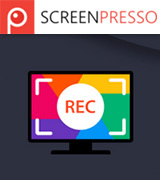 Despite the lacklustre video editing options, the Screenpresso PRO did manage to impress us with a few unique features that its competitors lack. For example, the software’s ability to record video from your smartphone's screen is certainly something that may be worth the purchase. Besides, the image editing tools of the Screenpresso PRO are also quite broad, even if they’re not something groundbreaking. If the above-average price tag and the lack of comprehensive video editing don’t scare you off, you will surely find a lot to like about this program and its unique design and capabilities. Most of the screen grabbers only work on a single computer at a time and even if you’re fine with that restriction, you won’t be able to even launch a lot of screen capture software on Mac. Thankfully, the Screencastify extension for Google Chrome serves both of these problems in an elegant and affordable way. This program works simply as an add-on to the browser and, since that piece of software is available both on Windows and Mac, can be used on any OS. That already gives it a leg up on the competition but what cinches it even further is the free version that you can use as much as you want. Pretty much the sole important restriction you’ll have is the watermark on all of the recorded videos which, while noticeable, shouldn’t be an issue if you need the program for casual recording and not professional streaming. If you do want to get rid of the watermark, you can simply subscribe to the premium version at a mere $2/month. One of the few downsides to Screencastify being a simple browser extension is the fact that it’s not always able to offer the versatility seen in other software. For example, your output format choices are limited to just five. However, the Screencastify is the sole screen recorder we’ve seen that can actually create gifs out of the footage you take. If you tend to take a lot of screenshots you know how easily things get messy in terms of storage. 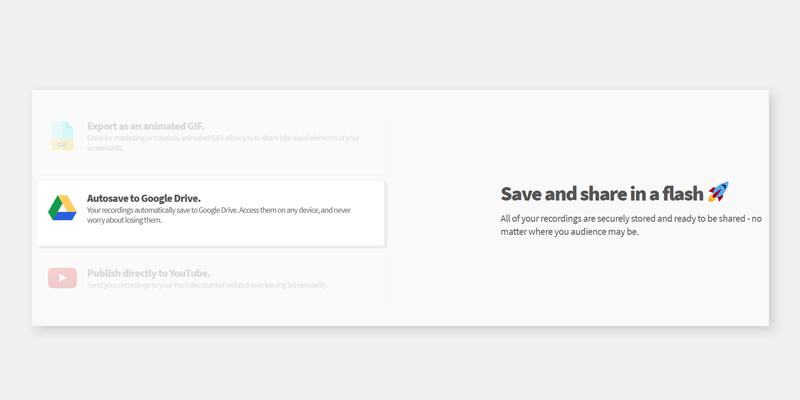 But Screencastify doesn’t have that issue as it uploads all of the recordings and snapshots to your personal Google Drive account (storage space there can be expanded via additional payments). Instead of ending up with several folders full of varying images, you’ll always know where everything is and have it sorted. 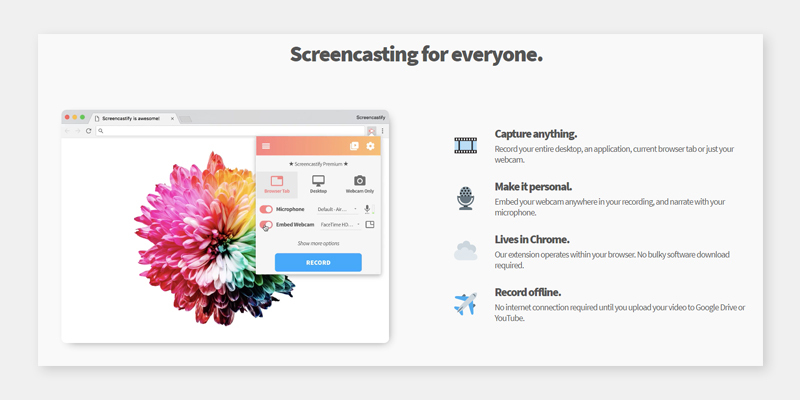 Don’t think that you can only record your browser or be online to take advantage of the Screencastify PRO’s capabilities just because the program integrates with Chrome. It works perfectly well offline, though in that case, you’ll have to save the files on your own computer instead of uploading them seamlessly to the Google Drive like you usually would. In terms of recording features, you can choose which open window the program captures, certain areas, or your webcam input. You can even embed the stream of video from your webcam into the recording, useful for podcasts and streaming. It does feel like the video editing capabilities might be just a bit sparse but it’s tough to complain about that at such a democratic price point. You can still manipulate the footage a bit and cut it or convert it to other formats, which are two of the most popular functions anyway. 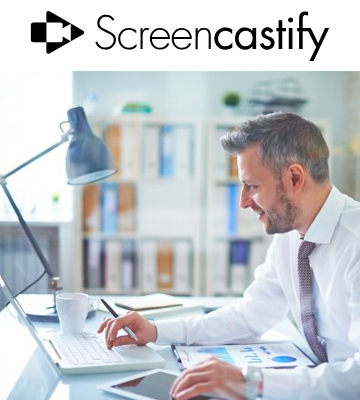 The Screencastify may seem like an ugly duckling among all of the other software that requires an installation process and stands on its own. But it’s the perfect screen grabber for the modern age: small in size, integrated into the most popular browser in the world, and easy to use. 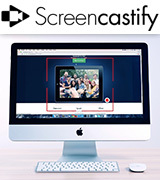 Unlike many of its standard counterparts, the Screencastify PRO is affordable, works well with both video and images, and won’t crash or hog all the processing power of your computer. Sure, it has its flaws but no program of this kind is perfect and if you want your screenshot library to be at your disposal no matter where you are, this is the choice for you. 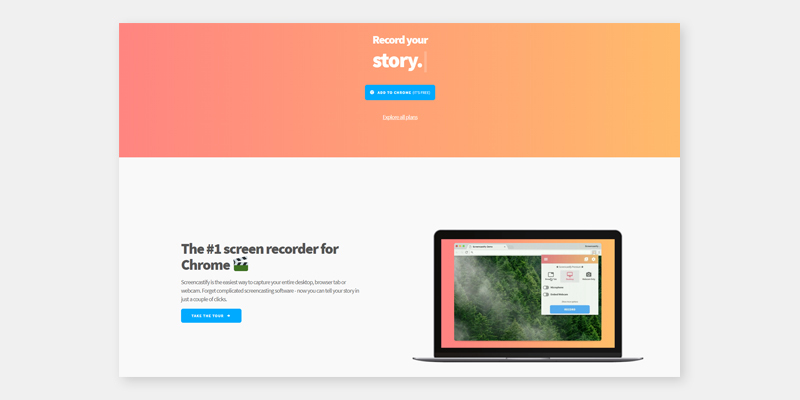 Whether you’re looking to show something on your desktop to a colleague, trying to record a video for YouTube, or take a screenshot, a screen grabber is going to help you to get the image and audio you need. These programs vary in functionality with some of them recording HD videos, taking snapshots of the monitor, and more, while others simply create screenshots or don’t record sound. Either way, any program you choose should be easy to control and have a simple interface because a task like this shouldn’t take any of your time. However, you should also look for a healthy range of options that you can adjust, including picture quality, length of recorded videos, sound quality (if applicable), and much more. 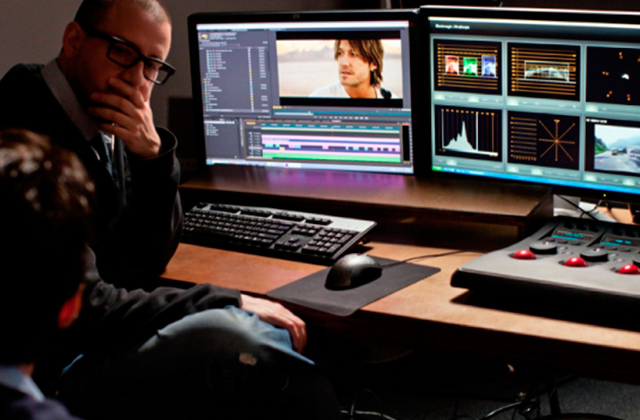 As for the post-capture features, an extensive editing mode is a big plus, especially if you only want the recipient to see certain parts of your screen and not the whole thing. If your display recorder of choice doesn’t happen to have good editing capabilities, you can consider getting some video editing software. You might also want to get some graphic design software for editing the screenshots and adjusting them as you see fit.